This weekend we’re doing burgers on Saturday and healthy fish chowder on Sunday. Both would benefit from some bread rolls, and what isn’t improved by adding bacon, cheese and jalps? So they’re going in the rolls. 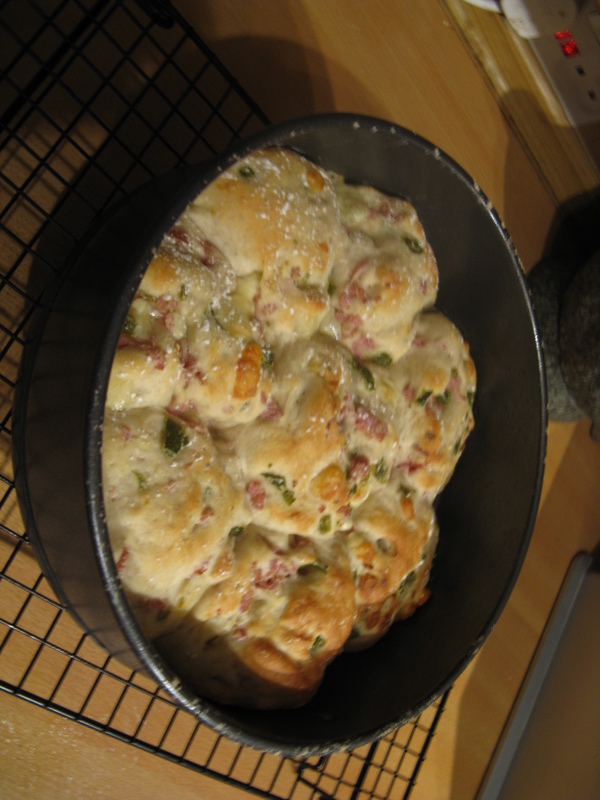 The rolls are from Paul Hollywood’s Bread book. 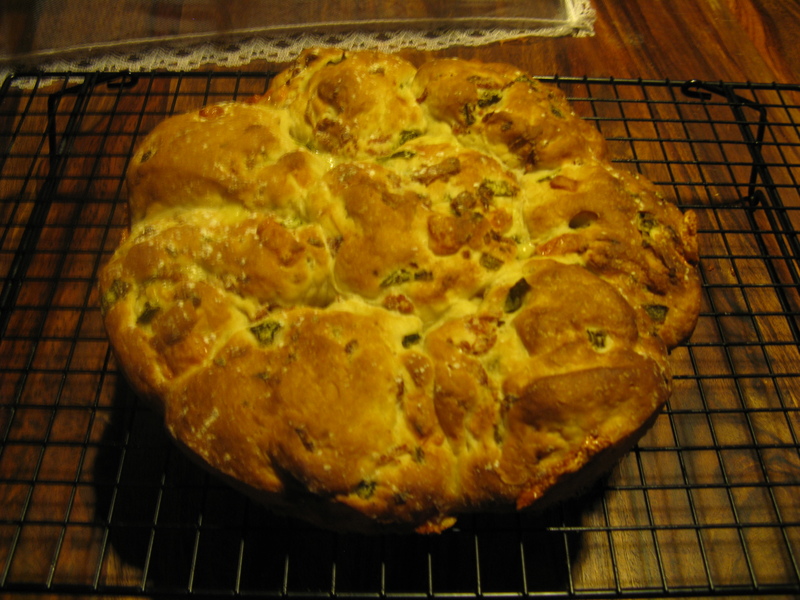 His are bacon and Stilton, and make two batches, and aren’t done in a tin. So we’re tweaking the flavours, only doing one batch, and doing them in a tin (as we saw him do at the BBC Good Food Show). Everything but the water in the mixer and mix, then pour in the water while it mixes. I ended up adding about 10ml extra water as it was very dry, then let the mixer knead it until it’ nice and stretchy. It then proves until it doubles in size, about 90 minutes on the radiator for us. The Cheddar gets cut into small cubes. The bacon is fried then but into small pieces. The jalps get chopped small and dried on paper towels. They all get mixed up in a bowl and tossed with a few shakes of flour. 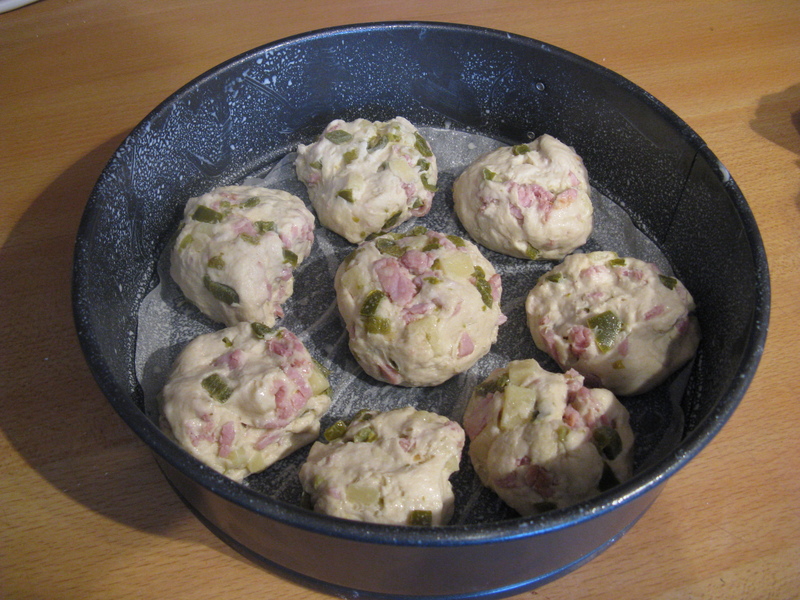 After the dough has proved it gets knocked back, then the filling is folded and kneaded into it. 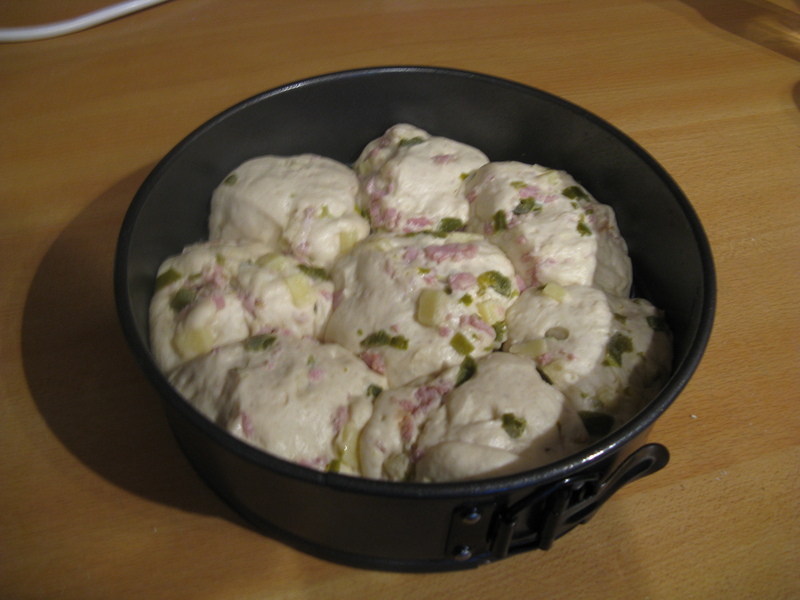 It’s then rolled into a sausage and cut into 8 pieces, and popped in a lined and oiled cake tin. These are then left to rise until they’ve doubled in size and are touching. Before going in the oven they get sprayed with water and dusted with flour, then it’s 15-20 minutes at 220c fan until they get to over 90c internally. When I took then out after 15 minutes I thought “they’ll need a few minutes more” but when I took the temperature they registered 94.5c so I guess they didn’t need the extra time. They’ll keep cooking as they cool, so hopefully they’ll be fine. No. After cooling and removing from the tin they were clearly undercooked! So back in the oven for 10 minutes. 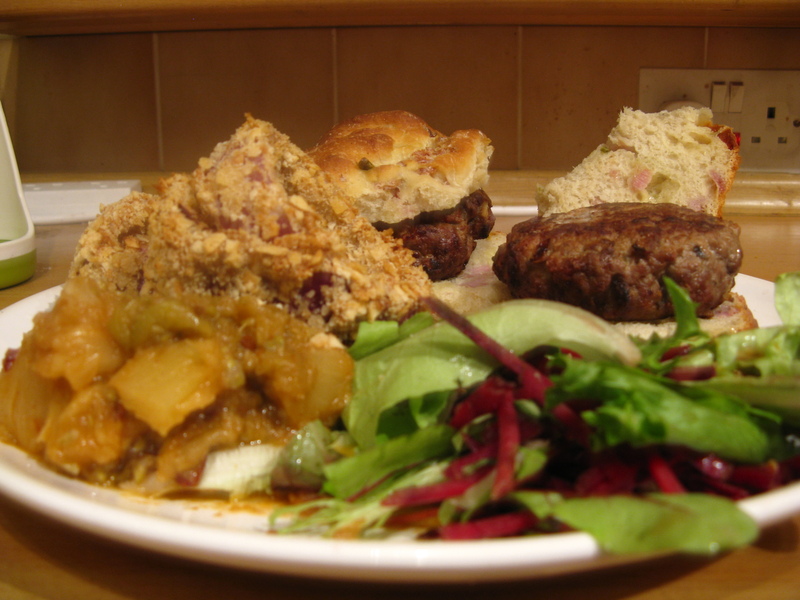 Then we served with burgers, pineapple & gooseberry spicy relish, and baked onions rings. It was all amazeballs! Juicy burgers, crispy baked onion rings, spicy fruit salsa… and really fluffy bread with a good salty and spicy kick to it! The extra 10 minutes you added gave the rolls a lovely colour.